Beautiful 4-color graphics on all 4 sides make this bag really POP! Print edge to edge on every side for bag that is uniquely yours. Super strong and tear resistant, even at pressure points, this bag is a favorite for consumers who value strength above all other bag attributes. This bag is highly customizable with options for trim, handles, finish, and bottom printing. We can help you create a bag that will be your customers’ favorite bag. Available in quantities of 2500. Imprinting 4 color printing on all four sides included. Setup included for identical art on opposing sides. 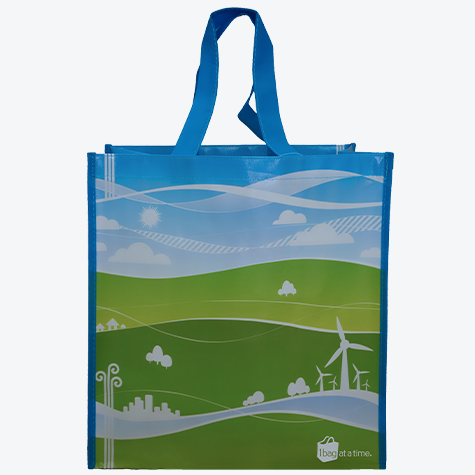 Full Color Reusable Bags are the hottest trend in eco-friendly bags. It’s easy to see why. Four color processing, edge to edge on all four sides make your images POP! These laminated bags have 120 GSM fabric, so you can actually feel the quality and durability. Convey exactly the quality, strength, mood, and core concept of your brand in a bag that becomes the ultimate packaging for your goods or promotion for your company or organization. See more photos here for ideas. The fabric is super strong and designed to resist damage even at pressure points. So it’s a perfect trade show bag as well as a grocery bag. Need a larger or smaller size? No problem! We can customize every detail to get you exactly the right bag for your purpose. Our Full Color Reusable bags start with minimums of 2500 pieces. All set up fees are included for artwork that is identical on the front and back, and identical on the gussets. If you want different art on opposing sides, additional set up fees will apply. Our laminated bags also come with recycled substrate for an even more eco-friendly bag. See our Recycled Reusable Bags. If you are looking for great graphics on a lower minimum bag, try our Big Splash Bag. We can help with art too, often free of charge, to help you find exactly the look that shows off your message best. Contact us today for a quote.